For a festival that started with an aversion to sponsorship deals, this year's Coachella Valley Music and Arts Festival seems to be making up for lost time. This year’s sponsor list includes Absolut, Amazon, American Express, Bose, BMWi, Calvin Klein, Cupcake Vineyards, Gooogle Pixel 3, GT’s Kombucha, Heineken, HP, Marriott’s new loyalty program Bonvoy, Method, NYX professional makeup, Pantent, Peet’s Cold Brew, Postdates Uber and YouTube Music. The event takes place in Indio, Calif. over the next two weekends, April 12–14 and April 19-21. Over 200 Coachella "moments" have been offered since Marriott first partnered with the festival in 2015. 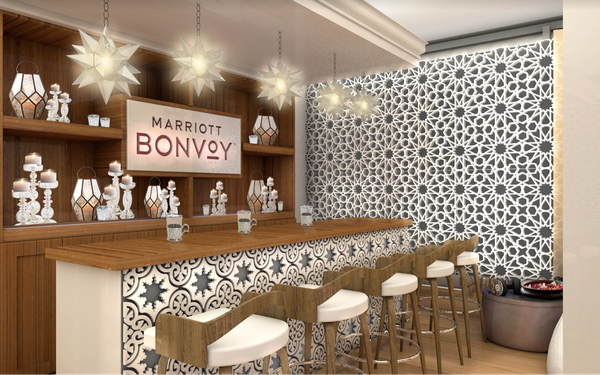 Marriott Bonvoy is the company’s new travel program and includes a portfolio of brands that offer "Marriott Bonvoy Moments," experiences that can be "purchased" with points earned from hotel stays. This year’s Coachella moments include VIP festival passes, and stays in W Yurts, styled by W Dubai, and in the Aloft Hotels Safari Tent. There's also access to the Bonvoy Bungalow, whose amenities includes butler service, free WifF, food and drink, a glam squad and masseuse, says Jennifer Utz Ilecki, vice president of buzz marketing and partnerships at Marriott International. For the last two years, BMW has been building up to the festival on social media with #roadtocoachella and is also showcasing a unique Coachella design for its BMW i electric vehicle. Featuring flames and the image of a wolf, it is inspired by the current album cover of Khalid, one of the headline acts. A group of hand-selected influencers and VIPs will experience the BMW fleet on the #RoadToCoachella drive between Palm Springs and the festival and will document their journey in real time with the campaign hashtag. Heineken, the official brew of the festival, returns to the desert for its 18th consecutive year. Heineken House is back and The Roots and De LaSoual are headlining. This year’s activation includes a new structure, new location at the festival and a sampling of alcohol-free brew, Heineken 0.0. Peet's Coffee is bringing its Peet's Cold Brew to festivalgoers as the official coffee sponsor of the festival for a second year. Peet's will host a Tap Room, vintage Bus "recharge" experience, and traveling Trikes with Peet's samples. Last year the brand provided attendees with over 60,000 samples of Cold Brew. Pantene, the official hair hair partner of the festival, is launching a #FestivalHair Capsule Collection Kit. Festival-goers can style their hair at Pantene styling stations where they can sample or purchase various Pantene products, including those that can help repair post-festival hair.